Wang Nan is a female Chinese table tennis. Wang remained as world #1 on the ITTF ranking system from 1999 to 2001. She is left-handed, and began playing table tennis when she was seven years old. Her particular skills are changing the placement of the ball during rallies and her loop drive, as well as her notable speed. 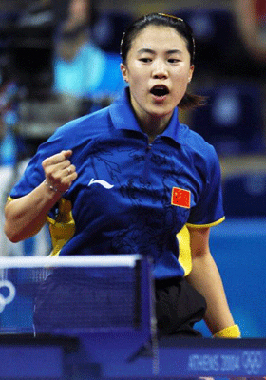 Wang has been the leader of the Chinese women's table-tennis team of China after Deng Yaping's retirement. In 1994 Wang Nan won the women's singles titles at the Sweden Open. The next year she was selected for the National Team and started to represent China at important competitions such as the World Table Tennis Championship, Women's World Table Tennis Cup and Olympic Games. From 1997 to 1998 she won the Women's World Table Tennis Cup twice, as well as the American Open and China Open. At the 1998 Asian Games in Bangkok, Wang won the four gold medals on offer (singles, doubles, mixed doubles and women teams). At the end of 1998, she won the ITTF tour finals. In 1999, she won the gold medal at the World Table Tennis Championships and the ITTF tour finals in both singles and doubles. She become world #1 in the same year. In the 2000 Summer Olympics in Sydney she won two gold medals in singles and doubles. Her excellent success record has resulted in her becoming a Grand-Slam champion. However, in the 2002 Asian Games in Busan, she lost two finals in the singles and women's teams competitions, winning no gold medals. Many people criticized her attitude and observed that she was inactive and lacking confidence. A lot of rumors claimed that she was going to retire because her skills were depleted and she could not compete on the improving world stage. 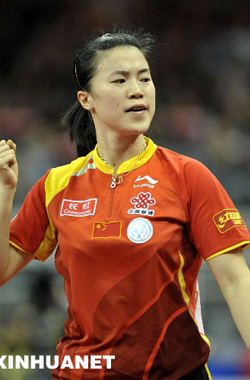 Wang Nan attended 2003 World Table Tennis Championships in Paris. This is her fourth time representing China. She won three gold medals in Singles, Doubles and Mixed-Doubles and of particular interest, she won the Singles' champion for the third time and Doubles for the fourth time, records which are hard to break in the future. Many people didn't expect her success before the competition began; however, the three gold medals proved that she was still one of the top players in the world. At the 2004 Summer Olympics Wang Nan failed to retain her singles crown but went on to win the women's doubles with Zhang Yining. Four years later at the 2008 Summer Olympics she made it to the Women's Final yet again, this time losing out to Zhang Yining, 8-11, 13-11, 11-8, 11-8, 11-3. She did, however, win the team gold for the host country.